“Sandbagging (law), suing for a breach of a contractual representation or warranty despite having known at the time of the contract that it was untrue. Sandbagging (sales), when one withholds sales on purpose to help him qualify for next month’s promotions or withholds due to laziness. 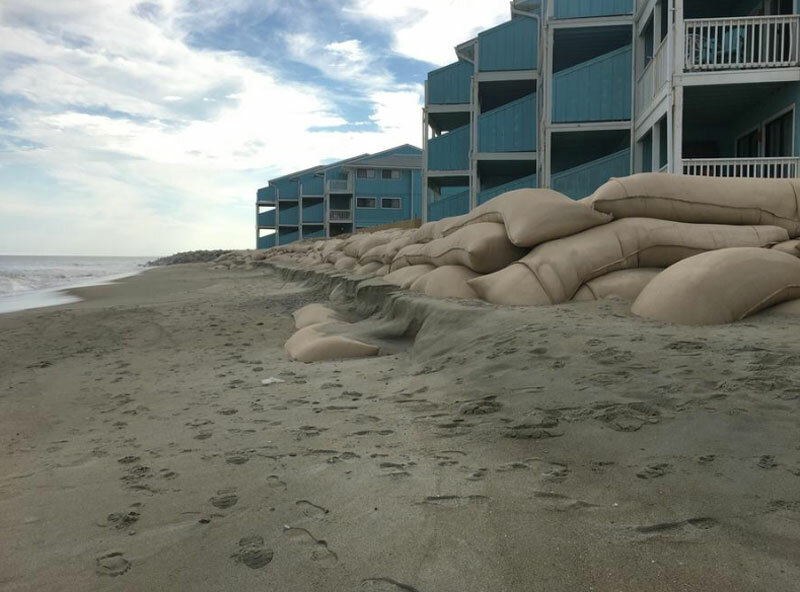 In North Carolina, using sand bags to build seawalls on the state’s beaches illustrates that the ‘sandbagging’ of these latter three types is as real as the physical structures. State legislators knew when they allowed ‘temporary’ sand bags that the time limits were not enforceable; that the background information for selling the idea of using sand bags wasn’t fully disclosed (laziness? ); and they ignored the advice that these structures were another form of shore-hardening and would lead to beach loss (Fig. 5). 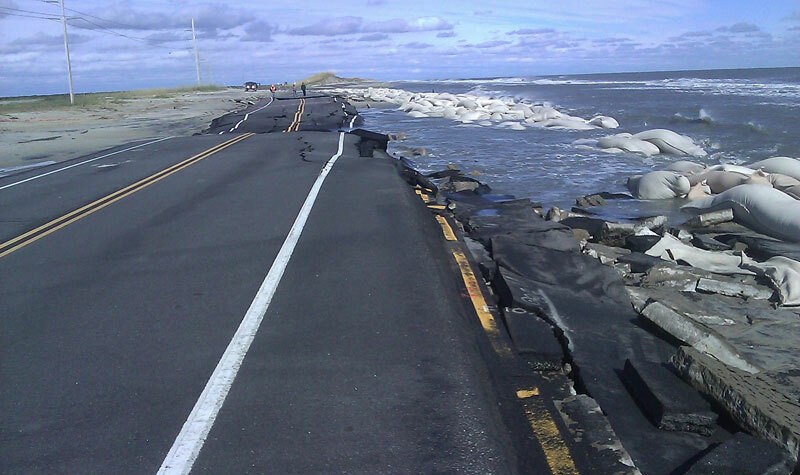 The North Carolina Coastal Area Management Act of 1974 (with later amendments) allowed ‘temporary erosion control’ structures. 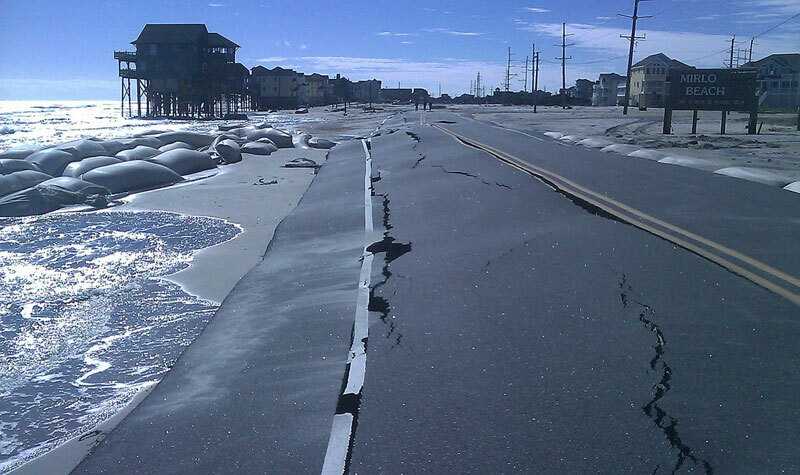 NCGS 113A-115.1 (b) states: “No person shall construct a permanent erosion control structure in an ocean shoreline. The Commission shall not permit the construction of a temporary erosion control structure that consists of anything other than sandbags in an ocean shoreline.” Such structures are subject to additional regulations under NCAC 7H .0308(a)(2) [Temporary Erosion Control Structures] that dictates their composition, size, location, and use, as well as the time frames that these structures are allowed to remain on ocean beaches. 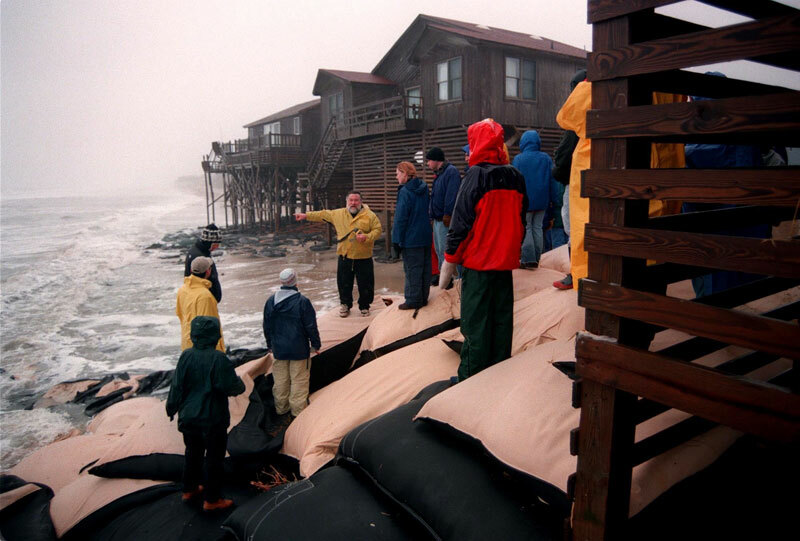 (See for a photo essay on the history and use of sandbag structures in North Carolina: Temporary Erosion Control Structures Sandbags – History and Use). This variance to allow ‘temporary’ structures seems logical, particularly for emergencies, such as a building or road placed in jeopardy after a storm (Fig. 6). 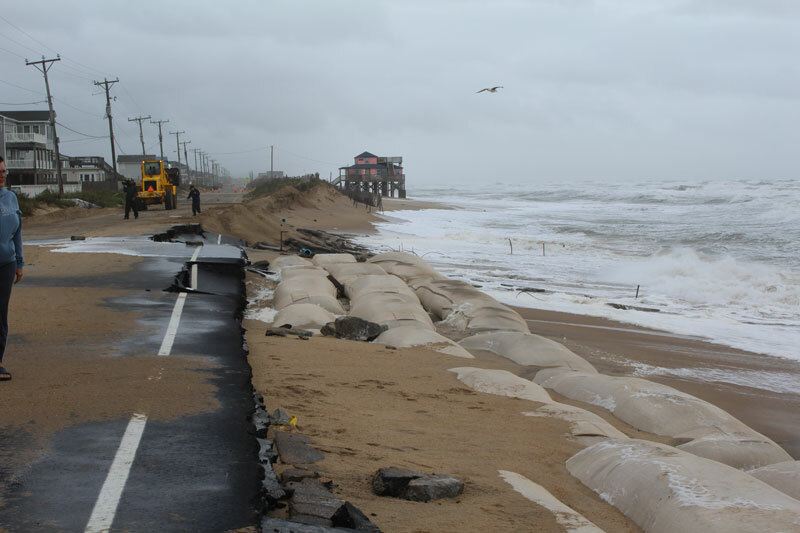 And the ‘temporary’ aspect that was set by a two-to-five-year limit for keeping such a sandbag seawall in place, before required removal, was enough time to see if the protective beach/dune would come back naturally, or that the building needed to be moved or demolished. The specific time limits were two years for buildings 5,000 square feet or less, and five years for buildings larger than 5,000 square feet. 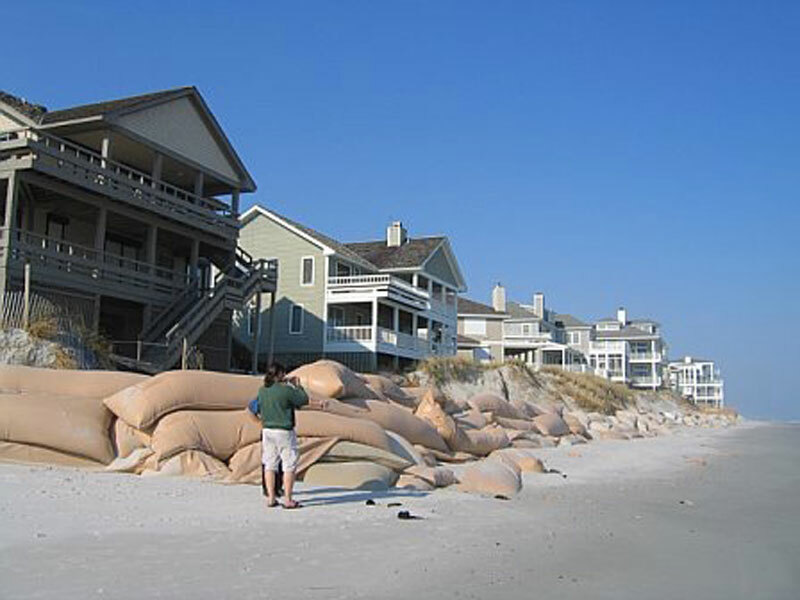 However, more extended periods were allowed for sandbag structures in areas where more threatening conditions existed, i.e., five years for properties located in a community that is actively pursuing a beach nourishment project, and eight years for properties located in an Inlet Hazard Area adjacent to where a community is actively pursuing an inlet-relocation project. The latter rules added variances to the existing variances, and an existing sandbag structure located in an Inlet Hazard Area could be eligible for an additional eight-year permit extension provided the protected building was still imminently threatened. So by law, “temporary” could be 16 years for some sandbag structures. From the installation of the first sandbag seawall and every sandbag structure since, these walls, groins, breakwaters, or ‘new technology’ structures have proven to be shore-hardening structures, adding to beach loss. 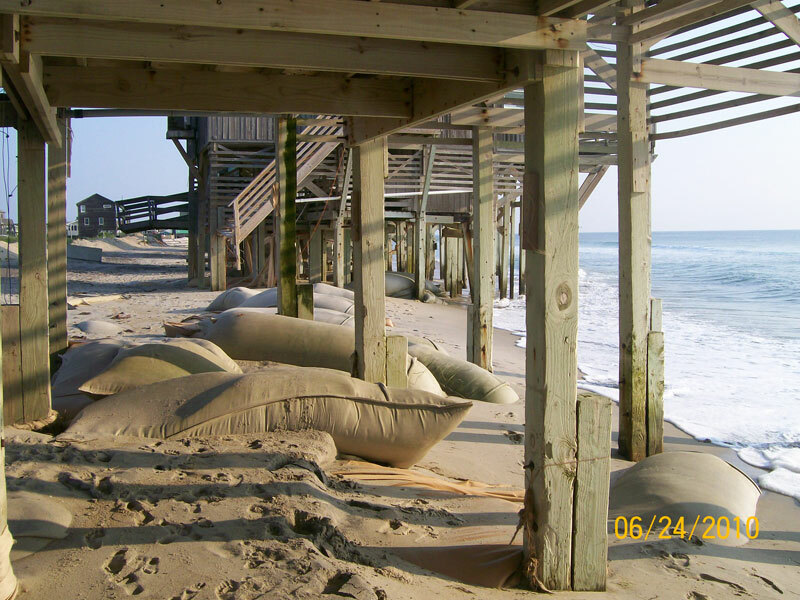 The photo essay noted above (History and use of sandbag structures in North Carolina), the 2017 Wilmington Star News photo set: “Recent history of sandbags along the N.C. coast,” and Google Earth images all demonstrate the loss of beach aesthetics due to unsightly sandbag structures, as well as their ultimate failure (Figs. 7 and 8). The existence of these structures has breached the original legislative ‘protective dike’ that banned such shore-hardening. And the variances have continued. In fact, the term ‘variance’ as used here implies some sort of an emergency or unusual case, but by 2016, approximately 370 sandbag projects were in place along the North Carolina coast—and there’s not a single one of beauty. The North Carolina Department of Environmental Quality’s Division of Coastal Management touts 320 miles of beautiful ocean beaches, but a view of the sandbag structures shown on Google Earth should be raising some serious questions among North Carolina’s taxpayers, if not the legislators. If little bags are good, bigger bags are better, or so the logic would seem (Fig. 9). 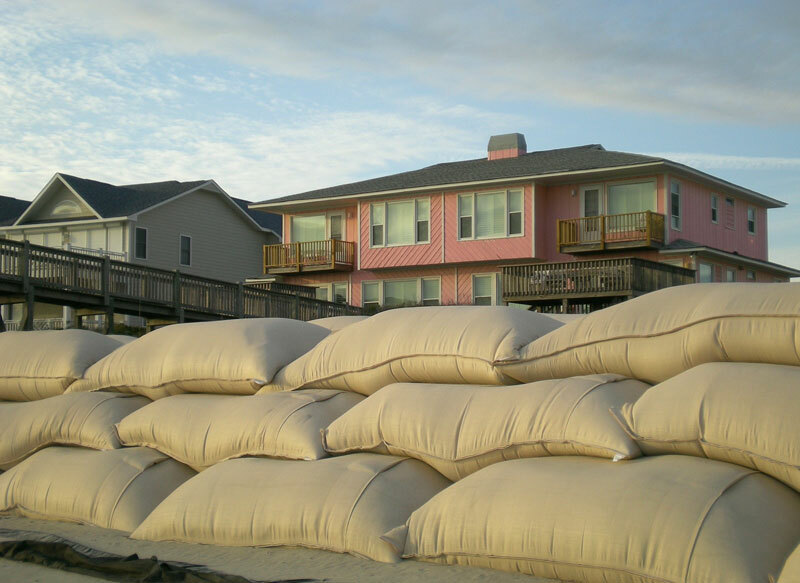 Sand bag size in North Carolina has evolved toward the larger, and those used on the state’s shores weigh 750 pounds or more. In 1995, a sand-filled-tube groin field on Bald Head Island was permitted (i.e., bigger sandbags). These larger sizes are in contrast to the law in South Carolina where only small bags, light enough to be carried by a strong person, are allowed (Fig. 10). 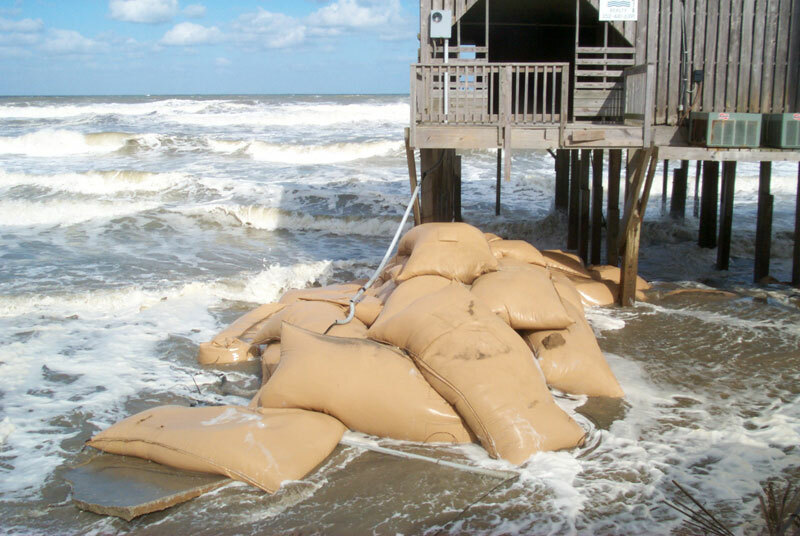 The obvious advantage of small bags is that a sand bag seawall can be quickly emplaced and quickly removed. 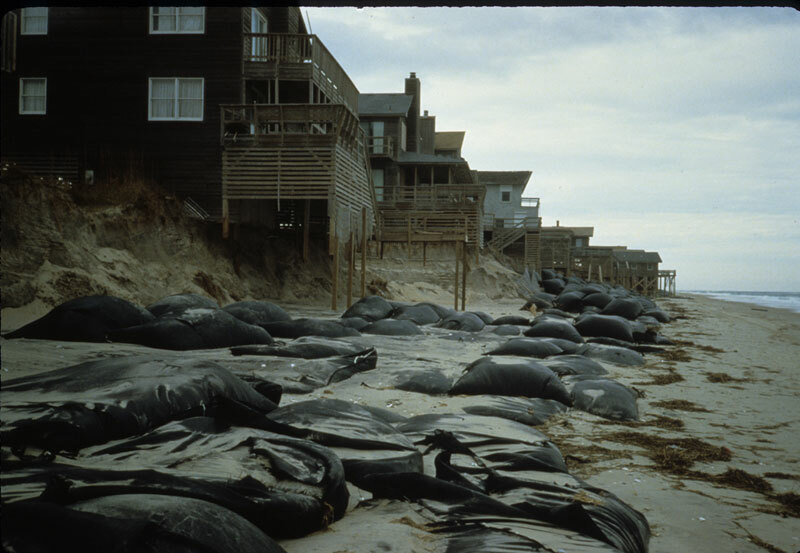 The disadvantage is that the small bags are readily displaced, removed and transported downdrift in big storms, and often are not cleaned up from adjacent beaches. 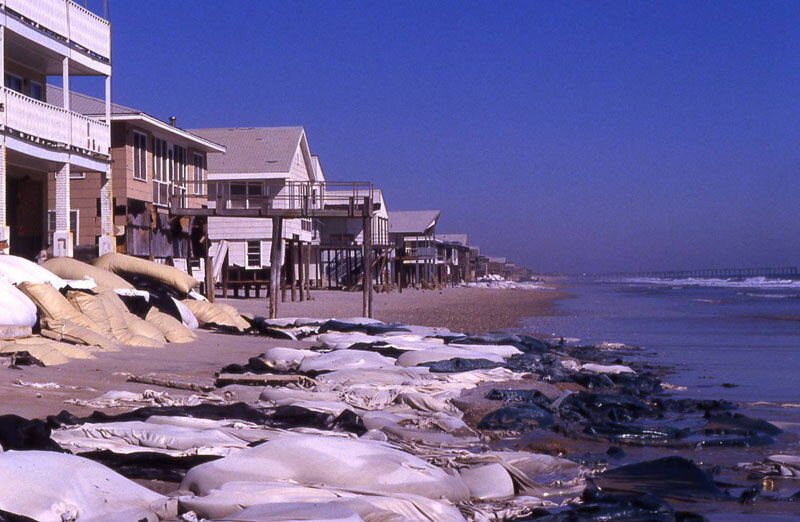 For example, during a big storm, thousands of torn plastic bags, that once were sandbags, drifted north from South Carolina’s Grand Strand communities to the beach on undeveloped Waties Island as litter, or were buried in the beach. On the other hand, the larger North Carolina sandbags are not readily removable. These bags are easily destroyed by storm-driven debris with sharp edges and protruding nails, or in rare cases through sabotage by knife-wielding people with an axe to grind (Fig.11). When the large bags are “deflated,” as is common, they generally remain partially buried in the beach sand. 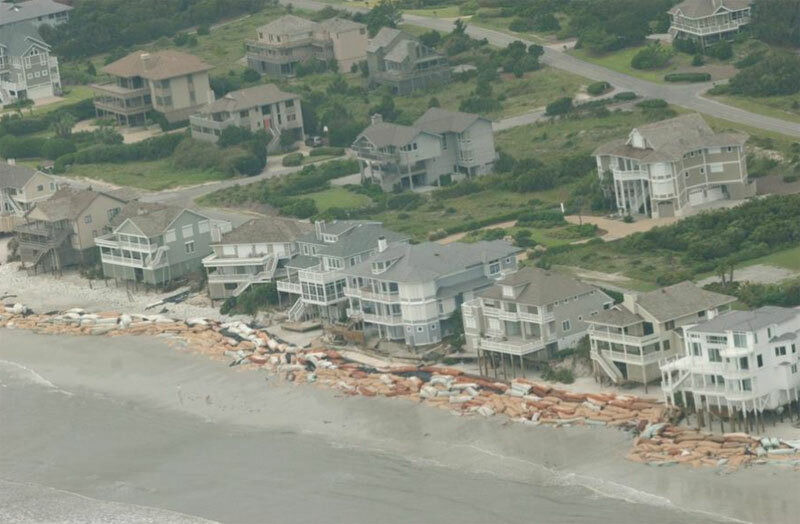 At the southern end of Figure Eight Island, two rows of destroyed sandbags remain visible on the beach, distinguishable by different bag colors. A third row of sandbags, still in a seawall, awaits a storm to join the others on the beach. At some other localities, the different generations of bags are apparent by their different colors (black, brown, tan) (Fig.B). Recently, attention has turned to the problem of non-enforcement of the time restrictions on temporary structures. 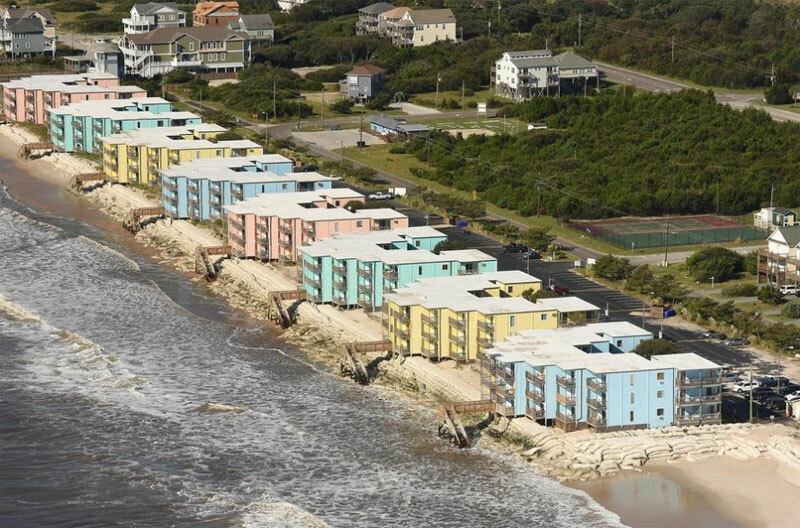 A Wilmington Star News article reported on such structures morphing into ‘permanent,’ focusing on the Riggings condominium complex at Kure Beach (Fig.C). Sandbags have been in place there since 1985 (over 30 years), and there does not appear to have been any effort on the part of the homeowners association to resolve the problem other than to apply for new variances. 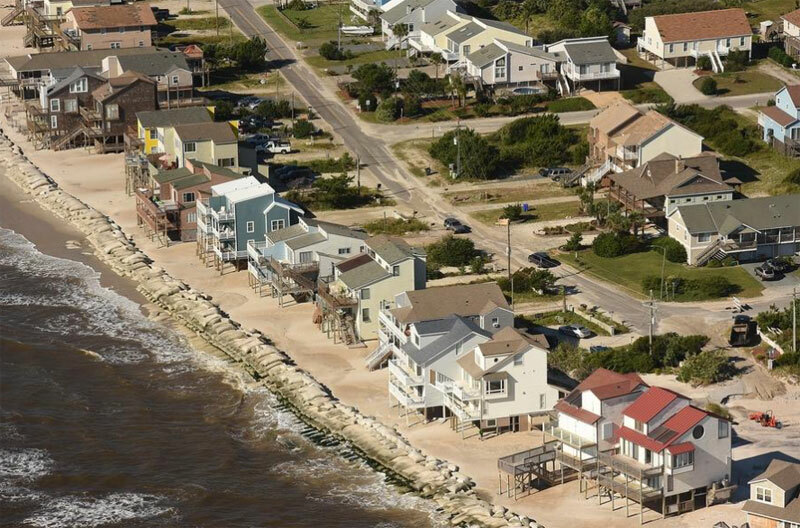 Beachapedia (2017) reports that the 48 homeowners of the complex rejected an offer from FEMA of a $3.6 million grant to move the complex across U. S. 421, out of harm’s way, in 2006. 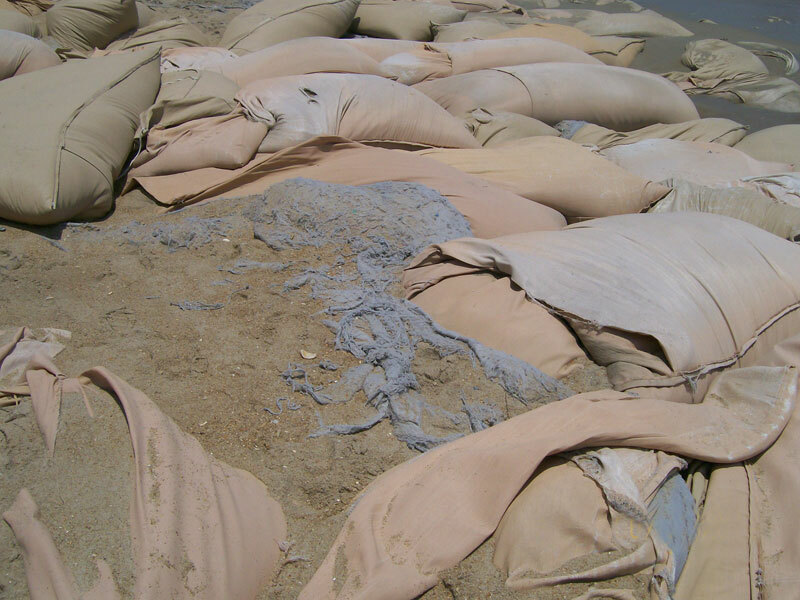 In July 2006, their plan was to cover the sandbags with sediment and vegetation. That action would have eliminated the need to apply for new variances, as the rules allow buried sandbag structures to stay in place. However, if such a sediment cover was ever emplaced, there is no evidence of it in subsequent Google Earth images, and survival of such cover seems unlikely under existing wave conditions. In fact, if one observes the Google Earth images, the conclusion is that the equilibrium position of the back of the beach is landward of the two most seaward buildings (similarly true for other localities with sandbag structures). So why hasn’t the State acted to enforce removal of temporary sandbag structures? One can say that they have, sort of. 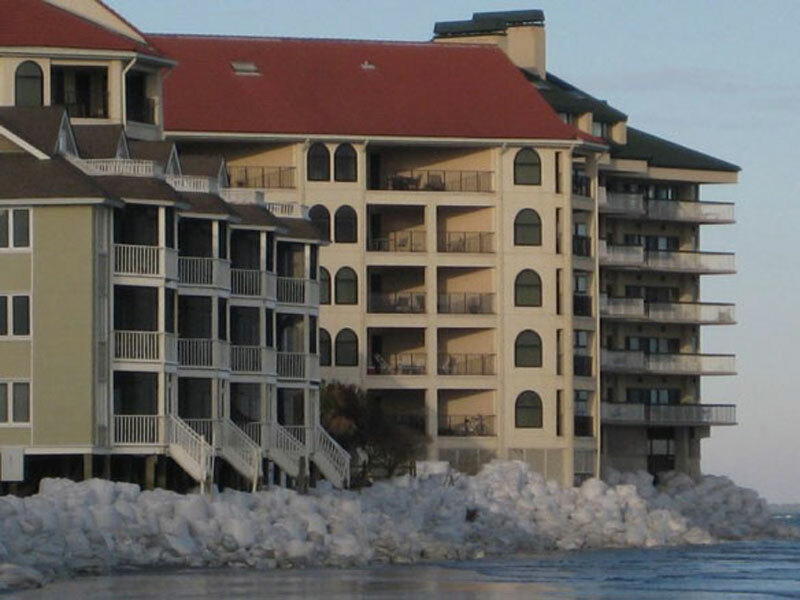 An ultimatum was sent to the Riggings condominiums requiring the sandbags be removed by 2006, but there seems to have been no political will to follow through. In fact, the CRC has tried to do the opposite. In 2015, the CRC attempted to adopt a rule that would allow the two-to-five-year clock to restart each time a new sandbag was placed on the pile, rather than being a one-time event from the first construction, i.e., temporary is forever at one-sandbag-at-a-time (Wilmington Star News, Feb. 8, 2017). Fortunately the North Carolina Rules Commission could see through that smoke screen. The CRC also set May 1, 2008, as a deadline for the removal of approximately 150 such structures along the state’s coast, but by July of that year hadn’t enforced its removal notice (Beachapedia, 2016), nor since. The north end of North Topsail Beach, another community with a history of management problems (Figs. 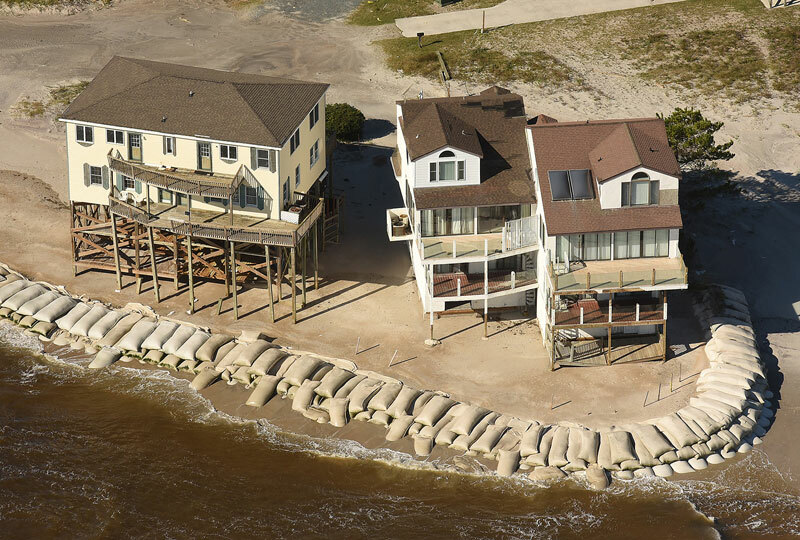 12, A, D and E), now has a long sandbag wall which is acting as a shore-hardening device (see Google Earth images that show beach narrowing, as well as houses on what should be the natural beach position, but behind the sandbag wall). 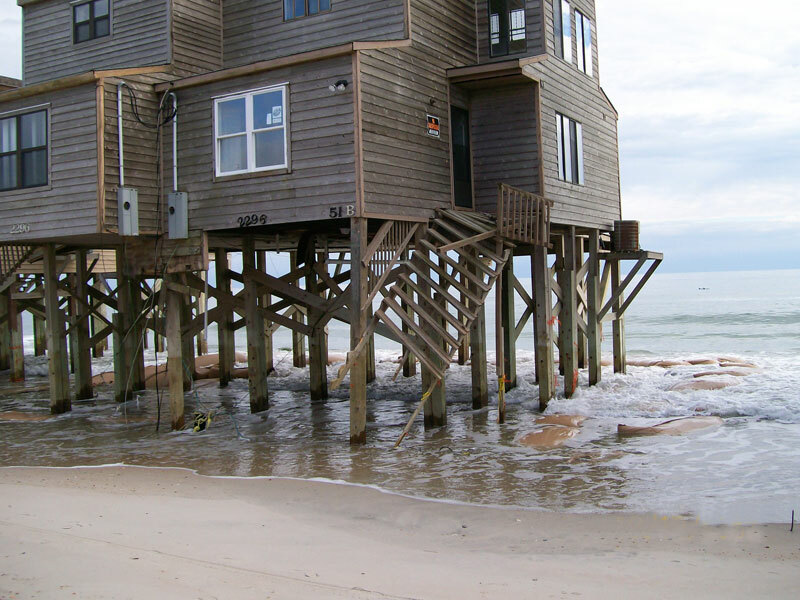 In 1995, the CRC granted a variance (mentioned above) to allow a sand-filled-tube groin field on Bald Head Island, but by 2015 the residents on the island felt a terminal groin (in effect a jetty) was necessary. Terminal groins are another major breach of the original state Coastal Area Management Act. Hibbs, 2016, reported that (NC DEQ, 2016) in 2016 the CRC changed the rules again, allowing sandbags to be placed virtually anywhere with no requirement for an imminently threatened structure, so that the huge sandbags can even be placed in front of a vacant lot. This new rule was mandated by the state legislature. 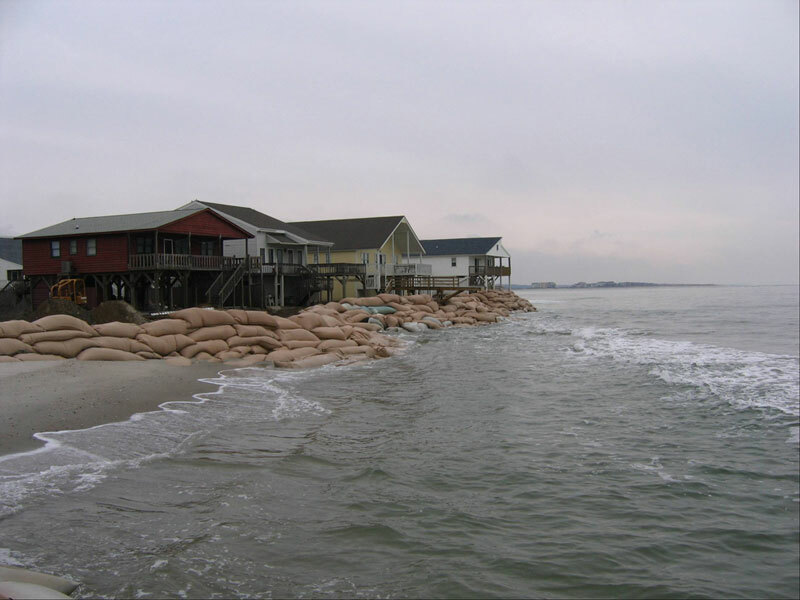 Sandbag walls can be constructed from one shoreline property boundary to another, and potentially, continuously along an entire island front (see Google Earth images of North Topsail Beach, the harbinger for North Carolina’s once pristine shore). Less protective beach/dune and more buildings behind the sandbag line spell coming losses of ever increasing magnitude. 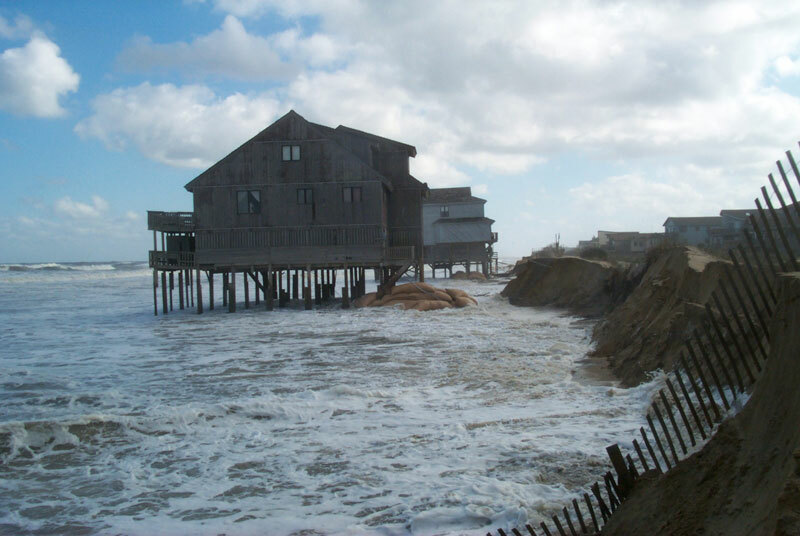 North Carolina’s Division of Coastal Management states their responsibility is “…to protect, conserve and manage North Carolina’s coastal resources…” and that responsibility lies equally with the state’s legislature. Unfortunately, both past and present state legislators have not lived up to that responsibility, and instead have engaged in sandbagging in the sense of not being true at the time of a ‘contractual’ allowance of temporary sand bags; of engaging in political ‘laziness’ in accepting an untenable short-term remedy, placing more emphasis on protecting private buildings than on protecting the public’s beaches; and not utilizing the coastal expertise at hand, but promoting what was most palatable politically for short-term gain at the long-term expense of the public’s beaches. Thus the label—political sandbaggers at the shore.